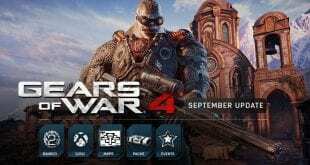 Gears Of War 4, published and developed by Microsoft Studios and The Coalition, is coming out for Xbox One and PC on 11th of October 2016. A third-person, single or multiplayer game, that gives you the feeling of obligation and duty, power and commitment. Fight for the man kind, who must be saved from the other civilization, that concord the world. Want to know more about the characters in GOW? Excited? Wait until you see about the new gameplay of Gears Of War 4. We all know from before about Marcus Fenix, a resilient-as-nails and ex- soldier, who escapes out of jail to help his former team mates, so together they can fight with the Locusts, a civilization of threatening underground creatures that previously came out of the ground all across the planet and started killing the human world. Gears Of War 4, now, is looking to make the things a little bit different than the previous series. Developers have been working on that matter. They have bring us, new members of the squad. JD Fenix – The born son of the legend Marcus Fenix, Kait Diaz – “Outsider” that will help the team with her off land knowledge. Delmont ”Del” Walker – JD’s best friend, Reyna Diaz – Kait’s mother, a fierce soldier and the leader of the ”Outsiders”, Oscar Diaz – Kait’s uncle and Reyna’s brother-in-law. All of them can be your multiplayer characters of choice. PC gamers? Here we have the minimum requirements that you will need to play the game: OS: 64 bit Windows 10 – version 1511. Processor: Intel Core i5 @ 2.7Ghz or AMD FX 6-core. Memory: 8 GB RAM (2 GB VRAM) Graphics: Geforce GTX 650 Ti or Radeon R7 260x. Pre-order of the game, will bring you bonuses, such as new weapons and exclusive characters, and you can start playing 4 days before the official date release, only for $59.99.